Traditionally the Fire & Rescue Service has always had a reactive approach to their duties and responsibilities. Their main aims and objectives are to save life, property and render humanitarian aid. In effect they will respond to fire incidents and other emergencies as and when they occur. There is no doubt that Strathclyde Fire & Rescue (SFR) carry out these duties to a very competent level and the public opinion of the service we provide is very high. It is widely recognised that the roles and responsibilities of the Fire & Rescue Service have changed in order to meet the new demands of todays� modern world. There is also a definitive responsibility to attend road traffic collisions (RTC), whereas previously this was always classed as a special service and subsequently there was never any dedicated funding provided for this type of service. With the introduction of this Act, the role of our Fire Safety Enforcement Officers has also changed. They now have the responsibility for the audit of risk assessments for all industrial and commercial properties within their organisational area. Over the last decade, as well as trying to maintain this standard of operational readiness, there is a much greater emphasis on the proactive work that SFR can do to prevent fires and other operational incidents. This is achieved through community involvement and engagement and involves the operational crews providing fire safety advice and information to the general public whilst attending school, events and gala days. There is also a drive to increase the number of home fire safety visits (HFSV). This will allow more access into the houses of members of the local community and enable our staff to educate more on fire safety in the home. This is a very important issue to SFR as statistical data and analysis have shown that most fires, fatalities and injuries occur within the home. With the introduction of the Local Government Act 2003 there is also a legal obligation for the Fire & Rescue Service to engage in Community Planning and partnership. There is more accountability for all stakeholders with regards to best value in ensuring that the best service is provided for the local communities. Again this is an area, which SFR have improved upon over the last few years. As an organisation they clearly recognise the importance of working closely with other agencies to improve their own service delivery. Like all large organisations, SFR has a very balanced structure of personnel, resources and service providers. It has approximately 3500 staff, including whole time and retained/ volunteer operational personnel as well as full time and part time support staff. The head of the organisation is the Chief Officer who is Brian Sweeney. There is also a deputy Chief Officer and five Assistant Chief Officers (ACOs). There are five Directorates and each ACO�s is responsible for their own Directorate. Geographically, Strathclyde is divided into ten Area with each Area having responsibility for approximately four whole time stations. There are 39 whole time stations in Strathclyde.� Certain Areas where it is more rural will also have a number of retained/ volunteer stations. Each Area has its own Area Commander, and a Station Commander for each whole time station. 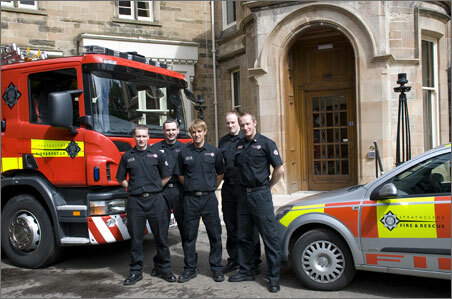 Clarkston and Barrhead Community Fire Station serve the East Renfrewshire area. The Area is also supported by a Legislative and Community Fire Safety Department.